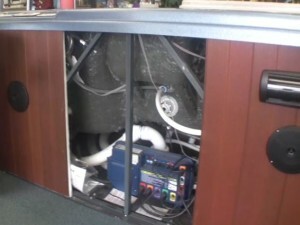 Some hot tubs have an interior drain valve located underneath the spa cabinet. 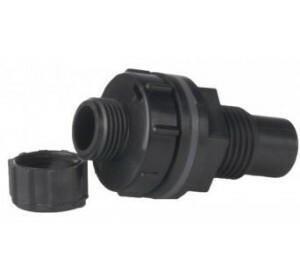 To access the drain valve, remove the side panel closest to the valve and hook up a standard garden hose to the threaded fitting. Then open the tap and let gravity do its job. 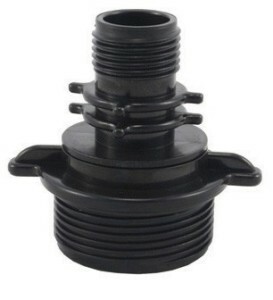 These types of gravity drains are also found mounted to the exterior of some spas. Some hot tubs do not have a drain valve at all. To empty this type of spa, it is best to use a submersible pump (and fastest too). Alternatively, a garden hose can be inserted into the spa water, then turn the water supply valve on until all air is out of the hose. Then stop the water flow from the supply side and unscrew the filled hose from the tap/supply. The water will use gravity suction and run out of the hose in reverse. This is a simple way of draining a hot tub that does not have a dedicated drain valve. But the fastest way to drain any spa with or without a drain valve is to buy a submersible pump. If using the internal drain found on some spa models, be sure to close the cap again when finished with the draining operation in order to avoid air getting sucked into the plumbing lines via the drain connector. If air is allowed to enter the plumbing, then poor performance or even air pockets can develop. Be sure to rinse off the filter when refilling the spa and replace the filter entirely every year. Enjoy your newly filled hot tub. To remove the new style QCA Spas side panels, simply flex the board slightly and remove. Some models may have layers of polystyrene behind the boards that also may need to be carefully removed when accessing interior components during a service or interior inspection. Replace the panels the same way being sure to replace any interior insulation panels first and then get the tongue and groove boards into the guide rails on the top and bottom of the cabinet. This style of cabinet allows for easy access to any point underneath the cabinet. Old style QCA Spa panels were single large panels that spanned an entire side of the spa. There were 4 of those type that required the removal of 6-8 stainless steel screws. The old style cabinets used an exterior drain and drain adapter. Most of the newer spas use the new system of integrated boards. These are also reversible in the case one side gets scratched or damaged.